The excellent performance of a Precast Prestressed structure to the high humidity and water treatment process is a major factor that leads to the use of Precast concrete for the construction of water and wastewater treatment plants. Few Building materials available today offer the economy, flexibility and reliability of Precast prestressed concrete. 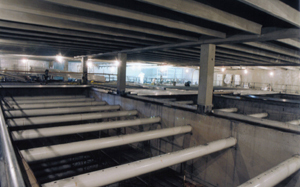 Durability is a major issue for water and wastewater facilities. Precast Prestressed concrete is resistant to deterioration from weather extremes, chemical attack, fire, accidental damage and the determined efforts of vandals. Precast concrete manufactured in a plant environment allows Strescon Limited to exercise precise control over the reinforcement and the concrete materials; placing and coring variables that affect durability, strength and appearance. Dense impermeable concrete can readily be produced by carefully controlling the materials, slump, water/cement ratio, air entrainment and the curing process. The impermeability of concrete is paramount and should be the first line of defense against physio-chemical deterioration processes that our treatment facilities are subjected to. Prestressing enhances durability by placing the concrete in compression and eliminating most cracking at service loading conditions. Hairline and structural cracking may allow oxygen and moisture to reach the reinforcement, providing conditions where rusting of the reinforcing steel and staining of the concrete may occur. Strescon's water and sewage treatment plants incorporate proven, reliable treatment processes and the latest technology available. plants are complete package systems, custom designed for any application - municipal, commercial and residential. They provide a long life of dependable service and quality.